A lot of buns taste better warm out of the oven - and slowly lose their appeal as they sit around. If there are any buns left by the next day, they're practically inedible in comparison to what was experienced when they were literally hot out of the oven. Not with these buns! These actually taste better when you let them get to room temperature. They are great the whole day, the next afternoon - and even the day after that. If that's not enough, they're also very simple to make - I'd say beginners level baking. Turn the oven on, you're making Butterscotch Buns! Cream butter and brown sugar together until light and fluffy. Set aside. Cut butter or shortening into cubes and put in flour mixture. Cut into flour mixture using a pastry cutter until crumbly. Make a well in the middle of the bowl. Slowly add milk 1/4 cup at a time. You may not need to use all the milk, please don't add it all at once! You want just enough liquid to hold the dough together. Once combined, knead the dough in the bowl a few times to ensure it's fully mixed. Transfer dough to floured board and roll out to 2cm thickness, roughly a 10X10 inch square. 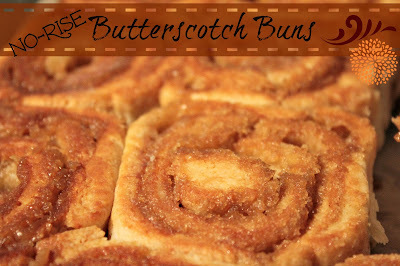 Spread butter and sugar mixture evenly on dough - spreading right out to the edges. I usually do this with a butter knife so I don't get overzealous and rip the dough with vigorous spreading. Tightly roll the dough into a log and slice into 1 inch pieces. Place a few centimetres apart from each other on a parchment lined baking tray and bake for 15-20 minutes. While buns are baking prepare a second cookie sheet with parchment paper. Once buns are done baking, place second tray over the first and invert the buns (flip them over on the clean tray). If you're a butter-a-holic, you can brush melted butter over the tops of the buns before they cool to keep the edges from getting too dry. If you can manage to wait until they are cool, they are better at room temperature - but I'll admit, knowing they're better cool hasn't stopped me from eating one hot almost every time I make them!